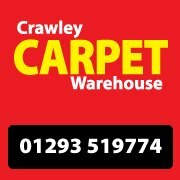 Crawley Carpet Warehouse Ltd - Carpets/Flooring based in Charlwood Road, West Sussex. We have a vast range of Carpets, Carpet Tiles, Laminates,Wood, Luxury Vinyl Tiles,Kardean, Vinyl's & Safety Flooring which you will find displayed in our three showrooms. If you can't get down to the shop, we do offer a no obligation, free measurement and quotation service with which we can bring samples to your house, making life a little easier for you. For more information or any questions, you can visit our website www.crawleycarpetwarehouse.co.uk, call us on 01293 519774, email us @ [email protected] or simply visit us at the shop where you will meet our friendly, knowledgeable staff who will answer any questions you may have and help you chose the right flooring for you. , Burgess Hill, Caterham, Crawley, Dorking, East Grinstead, Haywards Heath, Horley, Horsham, Redhill , Reigate , Salfords, Surrey, Sutton, West Sussex and surrounding areas.